Unlike so many other genre conventions, Creation Entertainment has a strict company policy not to "oversell" our conventions. In other words, every patron, no matter what bracket of ticket they purchase, will have a seat in the main auditorium where the major guests appear and events take place. Nothing upsets us more than hearing about other conventions that sell tickets to patrons and then those very same patrons have to wait on additional lines inside the facility to get into (or sometimes not!) the main theatre. An important Creation Entertainment difference we want you to know about! The Creation difference extends to our 40 years experience in running fan conventions. In the last few years we've seen promoter after promoter fail taking hard earned ticket money down with them. Inexperienced promoters, often first-timers, use celebrity images and names to get ticket money which they use to hopefully pay their expenses. When that fails they've already gone through "your" ticket money and they collapse leaving no recourse for ticket holders. They say "buyer beware" but this has happened in Twilight, Star Trek, Battlestar Galactica, and Firefly fandom (to name just a few) and we really feel for those great fans who have lost their ticket money and upset travel plans. Or call CREATION at (818) 409-0960 ext. 225** , 9:30am - 3pm Pacific Time. ***Attention Attendees: Do not purchase Ticketmaster Tickets from scalpers or anyone trying to offer tickets as you arrive at our convention locations. Each ticket is checked for authenticity at the door and we can not let you in if your ticket is counterfeit (which has happened recently). Please buy your tickets only from Creation or, if we are using them, Ticketmaster! Thanks, we appreciate your support! WANNA VOLUNTEER AT THIS CONVENTION? GREAT! IT IS MUCH APPRECIATED! Just drop Valerie (yeah, that Valerie) a line at the link below, mentioning the convention you are interested in! REMEMBER: All volunteers must be 21 yrs or older. See you at the show & have fun! We really appreciate your help in publicizing this event on-line. Grab our banners to put on your site! before purchasing your admission tickets. but will be available at the event. Full event schedule now posted! In 2007 and 2008 Creation Entertainment welcomed fellow FIREFLY/SERENITY fans from around the world to join in a unique and wonderful celebration. With great guest stars, fun events, non-stop partying, new merchandising, interesting and entertaining panels, autographing and photo ops with the stars: the response was totally fantastic. 2008's convention was sold out and in 2009 we're aiming to put together an even bigger and better experience! It isn't the same without YOU so make your plans to be with us for a time like no other! 2) You can save your tickets and then after the convention send them back to Creation Entertainment, 217 South Kenwood, Glendale, CA 91205 Attention: Ed for a refund We regret this inconvenience for our attendees and appreciate your continued support. 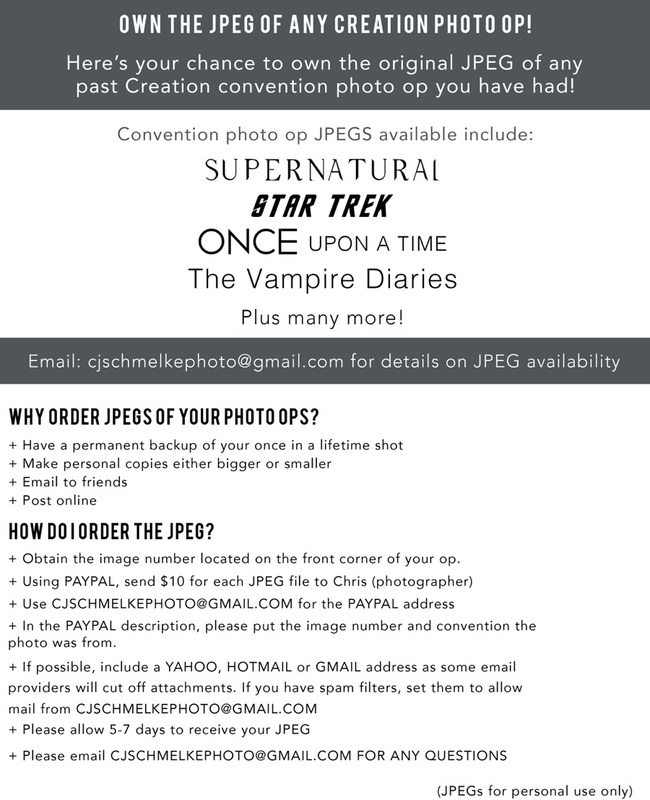 We know that taking photos makes the convention even more fun and we thought it would be a good idea to share our photo taking policies for you before you arrive at the convention so you can prepare. In the auditorium, photo taking is encouraged, but only from your seat. It is unfair to run up to the stage and block the view of others who have paid for reserved seats in front of you. Even if there are empty seats, patrons must sit in the seats they paid for to be fair to everyone. Due to fire marshall regulations everyone must be seated during performances. Please also be courteous to your neighbors when taking pictures. Photo taking is not allowed during autographing sessions nor during the photo ops. Only those people who have autograph tickets may come up to get autographs. At the Gold Exclusive Parties and Breakfast: photo taking is encouraged when the guests arrive (but only from your seats). After a sufficient time for all to get their photos we ask that your cameras be placed down so the celebrities can enjoy their time at the two food functions. Thank you for understanding the need to have these few rules so everyone is safe and has fun. 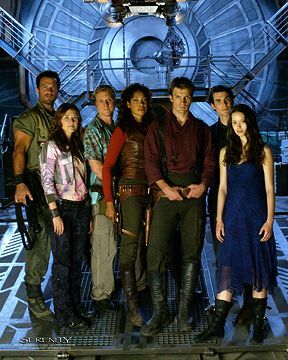 Make sure to be on our FIREFLY/SERENITY e-mail newsletter list to get announcements about FIREFLY/SERENITY events! We're happy to welcome aboard as a presenting sponsor the fine folks at QMx. They will have a huge presence at the convention with panel events discussing their unique product lines designed with fandom in mind. Make sure to check out their booths at the convention and meet the QMx staff: they are awesome! Join Jane Espenson and Tim Minear as they tell tales of the craft and regale you in stories about some of your favorite new and old shows, such as Angel, Firefly, The Insider, and Dollhouse. Jane Espenson has written for shows including Ellen, Gilmore Girls, The O.C, Angel, Firefly, and Dollhouse, among many others. She is especially proud of her work on Buffy the Vampire Slayer, and on Battlestar Galactica, where she wrote episodes, co-wrote the Emmy-nominated webisodes, and wrote and produced the BSG TV movie "The Plan.". Jane is currently Executive Producer of "Caprica," the Battlestar prequel series set to premiere on Syfy in January of 2010. A frequent partner with Joss Whedon, Minear spent four seasons as writer/director/executive producer on the “Buffy The Vampire Slayer” spin-off “Angel” before executive-producing another Whedon series, cult favorite “Firefly.” After serving as a consulting producer and director during the first season of DOLLHOUSE, Minear now serves as an executive producer and director during the series’ sophomore season. Minear’s association with 20th Century Fox Television and FOX includes executive-producing the quirky comedy/drama “Wonderfalls,” the noir procedural “The Inside” and the cross country mystery/adventure “Drive.” Additionally Minear served as a consulting producer on the dramas “Standoff” and “K-Ville.” Currently Minear is developing a post-911 re-imagining of the 1989 movie “Alien Nation” for SyFy channel. Shawna Trpcic helps create our most beloved characters by designing their costuming. From head to toe, she is the genius behind characters like Illyria from Angel and Inara from Firefly, Dollhouse and Dr. Horrible’s Sing-Along Blog and talks about new looks for new ‘verses! Shawna Trpcic (pronounced terp-sick) is a Hollywood Costume Designer for movies and television. She’s worked on many films including Galaxy Quest, The Core and Toys. She is perhaps best known for her work with Joss Whedon, designing costumes for Angel, Firefly, Dr Horrible’s Sing-Along Blog, Dollhouse and his upcoming feature film The Cabin in the Woods. Down in the deepest, most secure vaults at QMx’s top secret development facility, our team of crack designers is always hard at work, creating the shiniest Firefly/Serenity collectibles in The Verse. As has become our annual tradition, the QMx keynote at the Creation Serenity Con is the one time of the year where we throw open the vault doors and give you a look at what’s to come. Last year we revealed Serenity in her (as yet unpainted) glory. This year, we have even more surprises, big surprises, you’ll-kick-yourself-if-you-miss-it surprises. So arrive early and come prepared to be blown away. And bring your friends – no one is going to want to miss what we have in store for you! QMx is a boutique developer of screen-acurate replicas, collectibles and artwork inspired by entertainment’s most beloved shows and movies. We focus on serving the most demanding customers – from dedicated fans to the industry’s most prestigious production companies and studios – with the most detailed and accurate products as possible. In addition to our mainstream collectibles, QMx is also the creator of Artisan film-quality replicas – 100% handmade in the U.S.A. for the greatest accuracy and finest detail. Each item in our Artisan loine is crafted by the ame special effects wizards and prop makers who work on your favorite shows and movies. There simply isn’t a better quality replica available. Browncoats: Redemption’s Mike Dougherty (writer/director/co-producer), Steven Fisher (co-producer), Brian Wiser (co-producer), and Heather Fagan (lead actress) will talk about the film, the journey from concept to creation, how social media has impacted awareness for the charities and the project, and release their second teaser trailer as well as a sneak peek of a raw cut scene from the film. learn more about the film and the charity efforts at browncoatsmovie.com or follow them on Facebook and/or Twitter@browncoatsmovie. 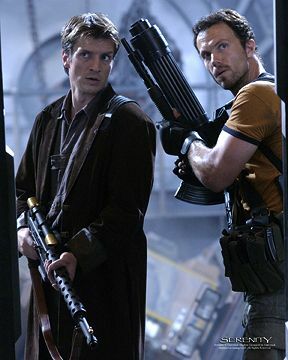 "Browncoats: Redemption" is a Firefly/Serenity fan film to be released September 2010. Donations raised from the film’s DVD will be given to five chosen charities supported by the creator and cast of the original series. Set three months after the events of the Universal Studios film, Serenity, Captain Laura Matthews and the crew of Redemption are unintentionally thrown into a situation that some view as the potential catalyst for the second unified rise of the Independents against the Alliance since Unification Day. The Alliane is looking for a scapegoat for Miranda, whereas those unhappy with the Alliance are looking for a rallying cry to take action. Through all of this, a secret about Laura is exposed that shakes the very core of the crew, threateing to break it apart, challenge the trust that Laura has earned with other Browncoats, and undo all of the efforts she has made to keep a sense of peace in her life since the first Unification War. Learn more abou the film and the charity efforts at browncoatsmovie.com or follow them on Facebook and/or Twitter@browncoatsmovie. Come join Serenity Graphic Designer Geoffrey Mandel as he shows you our favorite ship as you’ve never seen her before. years in the making, you won’t want to miss this up-close and very personal tour of Our Girl. Rules: one music video about SERENITY and/or FIREFLY may be submitted on DVD only (please no computer-based media like CD accepted). PLEASE USE ONLY NTSC FORMAT FOR YOUR DVD. Entries are judged on the following criteria: video quality, audio quality, editing quality, inventiveness, song selection, and originality. Humorous submissions are encouraged. Entries can not be returned, and person submitting entry is granting Creation the right to play this entry in perpetuity at Creation events worldwide and/or on line at the Creation website(s). Creation does not sell music videos so your entry will never be sold as a commercial product, just presented at our events/on line. Winners will receive a $100 gift certificate good for Creation products. Winners will be announced and certificates awarded on site; if you are not present we will mail the certificate to you so be sure to include your return address, phone number and e-mail. You may email our offices at to confirm receipt of your entry but we do not announce winners until the event. All entries are due at Creation offices by October 30th with no exceptions. Thanks and good luck! Note: Due to the high volume of entries for our Music Video Contests, we are forced to limit entries to those people actually attending the specific show they are entering for. You do not have to be present for the actual showing of your video, but you must claim your award on site before the end of the weekend or your award will be forfeited. As an extra treat for all of our great attendees Creation Entertainment is happy to present this special FREE PARTY for all! We've had a great time with our CREATION FRIDAY NIGHT Karaoke Parties at past events so come sing, watch, or raise a few with Creation staff, fellow fans and surprise celebrity guest drop-ins! You never know who might show up and it is a great way to mix and mingle! Exact times and locations will be announced on the printed schedule available at the convention itself (or on-line by the Wednesday prior to the opening day) ENJOY! The famous Creation Entertainment Costume Parade Competition is always a highlight of the convention. Set for Saturday here is your chance to show off your creative abilities by dressing as any character or making up your own. The winner goes home with a $250 gift certificate but we have prizes for everyone who enters! Another way that fans can show off their love of the shows we're honoring is by entering our famous themed CENTERPIECE CONTEST! This event takes place at our DESSERT PARTY (Saturday Evening) and is for Gold Members attending the event this weekend! Create the very best centerpiece that touches the hearts of our judges and the themes of the convention and you might just win a special $250 Gift Certificate! Just be "GOLD" and bring your entry to the party and that's all it takes to enter! WANNA SIT WITH YOUR FRIENDS?!? FOR ALL RESERVED SEATING TICKETS (everything other than general admission single day or general admission weekend packages) IF YOU WANT TO SIT NEAR FRIENDS YOU MUST ORDER ALL THE TICKETS TOGETHER UNDER ONE ORDER. and we'll look into it and get right back to you. Thanks! but will be available at the event! 1) The very best reserved seatings for daytime convention main auditorium events both days. 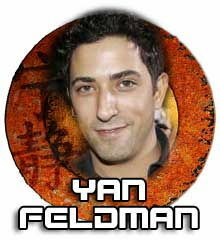 2) Complimentary in-person autographs from appearing celebrities offered in a non-hurried manner from guests including JEWEL STAITE, ADAM BALDWIN, MORENA BACCARIN, ALAN TUDYK, MARK SHEPPARD, RAFAEL FELDMAN and YAN FELDMAN. You get ONE autograph per celebrity, and have the option to purchase more if offered for individual sale. 3) Complimentary admission to the famous DESSERT PARTY with the stars on Saturday Night. This event, surely a highlight of the convention, is exclusive to GOLD WEEKEND Patrons. Music, delicious desserts, fellow fans from around the globe, celebrities and a cash bar to keep it hopping. 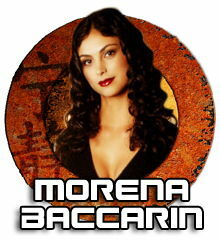 Guests tentatively joining us include ADAM BALDWIN, YAN AND RAFAEL FELDMAN, and MORENA BACCARIN. 4) Seating at the Sunday Morning Celebrity Brunch, another super-cool exclusive to GOLD WEEKEND PATRONS event. Always awesome! 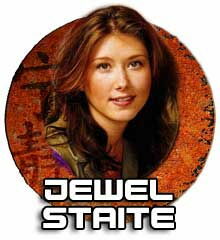 Tentatively appearing: JEWEL STAITE, MARK SHEPPARD and ALAN TUDYK. A silent auction will be held at the breakfast to benefit charities Kids Need To Read and Marine Corps-Law Enforcement Foundation. 5) First for autographs done row by row. Gold does have its privileges! 6) Pre-Registration so once you get your admission credentials which are special coded wristbnds you don't have to wait again. 7) Complimentary Gold Weekend Patron Exclusive Serenity/Firefly gift. Past gifts at conventions have included a gold coin, a plaque, autographed items, and souvenir carry bags. Tickets will be available at the event. 2) Complimentary in-person autographs from appearing celebrities offered in a non-hurried manner from guests including JEWEL STAITE, ADAM BALDWIN, MORENA BACCARIN, ALAN TUDYK, MARK SHEPPARD, YAN FELDMAN and RAFAEL FELDMAN. You get ONE autograph per celebrity, and have the option to purchase more if offered for individual sale. 3) Earlier times to get autographs when done row by row. You go right after our Gold Weekend Patrons! 4 Wristbands for immediate entrance without waiting on line after initial registration. Here is the best way to attend one or two days of the convention. You get a reserved seat (yours come and go all day) in the main theatre. Admission to the vendors room is also included. Does not include complimentary autographs which can be purchased separately below. Here's a great entertainment bargain: you see the stars and events in the theatre from a non-reserved seat in the back, and get into the vendors room. Does not include complimentary autographs which can be purchased separately below. Autograph and Photo Op Tickets do not include admission to the convention. �In order to receive your photo ops and autographs at the convention you must also be a convention attendee by having an advance admission ticket (bought on-line) or purchasing one at the door. Here is the incredibly rare chance to get an in person, non-rushed autograph from the sensational celebrities in attendance at this event. These stars will sign any item you bring from home or buy at the convention. There will be tons of great photographs and other collectibles available at the convention that will be suitable for signing purposes. If you have autographs included in the ticket packages you have purchased and you want more than one autograph per celebrity you can purchase them here and then get all your signatures from that celebrity at the same (first) time you are called up. Note: Patrons must bring an item for celebrities to sign. You can bring something from home or purchase a photo or other collectible in the vendors room. Please feel free to purchase as many autograph tickets of a particular celebrity as you'd like. Note: Guests appear ONE day of the convention, so therefore their autographing and/or photo ops take place that day, except in VERY rare occasions which will be noted. If you are not attending all days of the convention it is wise to wait until specific days of appearance are announced before purchasing autographs or photo ops. 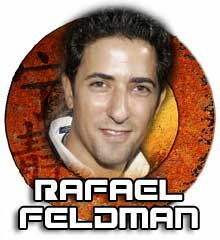 You must have an admission ticket to the convention to get autographs or photo ops. Photo Op Tickets do not include admission to the convention. You must have an admission ticket for the convention to enter into the photo op areas. Due to security considerations and guest concerns we cannot facilitate the giving of gifts to guests at the photo op sessions. LIMIT OF TWO FANS PER PHOTO-OP, NO EXCEPTIONS PLEASE! Our favorite souvenir, here is the opportunity to have a professionally shot full color 8 by 10 photograph of YOU with your favorite genre celebrities. You'll really love these! Please read: PHOTO OP F.A.Q. Stay overnight at the beautiful Marriott Los Angeles Airport and party with us! Call 1 800 228 9290 to get special lower than normal room rates of $112 for singles or doubles, mentioning the Serenity Convention to get these rates. Parking: The hotel offers special parking rates for those coming to the convention of $15 a day (self parking) and $23 a day (valet). Creation Entertainment holds a "block" of rooms for our attendees. These blocks of rooms have a lower rate than standard rates at the hotel, but they also have a "cut-off" point after which hotels may choose to revert back to their own higher rates for our customers. Usually this cut off date is one month prior to the event, but this does vary. Therefore it is always wise to book your rooms for our conventions as early as possible. Dealers: Click here for vendor table information. 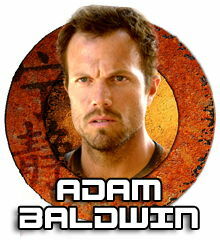 3:40 pm Private Meet & Greet Party with ADAM BALDWIN, check at registration for availability at $300 each. Limited to TEN fans. 7:20 pm Autographs with Morena, Adam, Yan and Rafael, complimentary for Gold and Preferred Weekend Patrons (whom we will call row by row, followed by those with autograph tickets for any or all of the celebrities (which we will call by number). Autograph tickets are available at registration for $15 for Yan or Rafael, $25 for Adam or Morena. 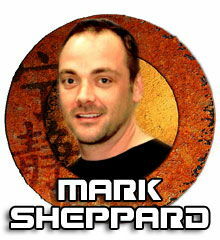 Tentatively appearing: JEWEL STAITE, MARK SHEPPARD and ALAN TUDYK. A silent auction will be held at the breakfast to benefit charities Kids Need To Read and Marine Corps-Law Enforcement Foundation. 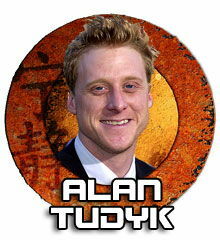 2:20 pm Alan Tudyk WIne & Cheese Private Party ($300) Please check at registration for availability. Ten total patrons: ENJOY! 6:30 pm Autographs with Alan Tudyk, Jewel Staite, and Mark Sheppard, complimentary for Gold and Preferred Weekend Patrons (whom we will call row by row, followed by those with autograph tickets for any or all of the celebrities (which we will call by number). Autograph tickets are available at registration for $30 for Jewel, $25 for Alan $20 for Mark. All guests and scheduling is tentative and subject to change.